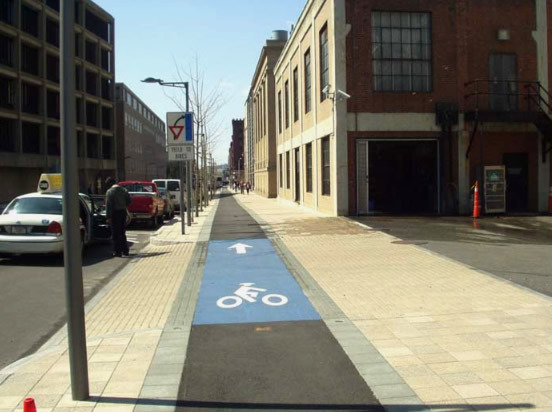 Cycle tracks, sometimes called separated or protected bike lanes, are one of the most promising new bike facility types to be implemented in the U.S. in recent years. Because cycle tracks physically separate cyclists from car traffic, they appeal to the “interested but concerned” category of bicyclists who would ride their bikes more if they felt safer doing so. The societal benefits of getting more people using their bikes for transportation, as well as the prospect of fewer deaths and injuries, make it worthwhile to provide cycle tracks in many contexts. However, they are not completely without drawbacks, as noted below, so their suitability should be determined on a street-by-street basis. To summarize, MoBike enthusiastically endorses cycle tracks as a facility type to be used where warranted. 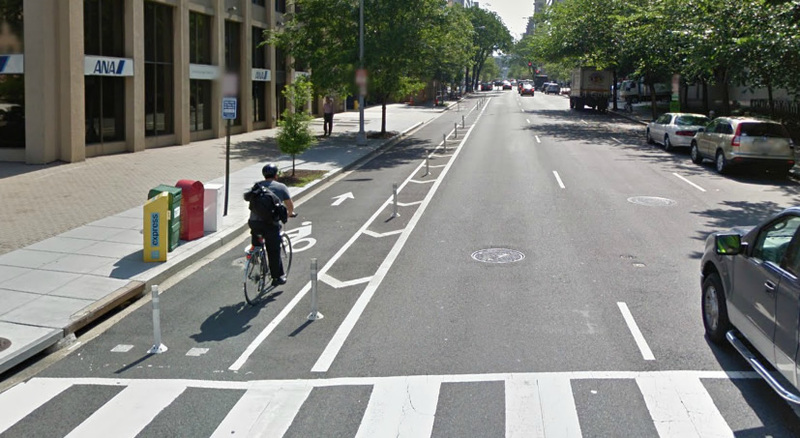 One-way cycle track on one-way L St NW, D.C. 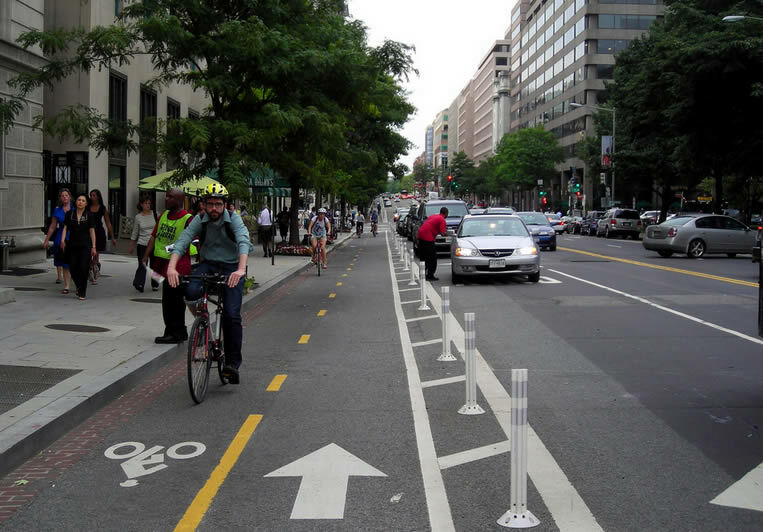 The distinguishing feature of cycle tracks is the physical barrier they place between bicyclists and car traffic, whether it’s a vertical barrier such as flexible posts or parked cars or a simple difference in grade provided by a curb. The barrier gives many riders the perception that they are safer than they would be in conventional bike lanes or standard vehicle lanes. This perception is often reality, since the configuration prevents or deters drivers from encroaching into the cyclist’s area and usually increases the distance between cars and bikes. Even experienced bicyclists may think twice before using conventional bike lanes on fast, busy roads, so cycle tracks can make these roads more comfortable for all types of riders. Cycle tracks can also make it possible to ride in both directions along a one-way street. Cycle track between the curb and sidewalk with painted crossing in Cambridge, Mass. Cycle tracks are often superior to shared use paths running closely alongside a road. They generally do a better job alerting drivers that they’re crossing a bike facility, by virtue of positioning or special intersection treatments such as green paint and warning signs. A one-way cycle track allows bike travel in one direction only and is located on the same side of the street as vehicle lanes carrying traffic in the same direction. Shared use paths, on the other hand, allow cyclists to ride in either direction on one side of the street, a riskier configuration because cyclists riding against the flow of adjacent car traffic can catch drivers by surprise at intersections. Because cycle tracks are dedicated bike facilities, conflicts between pedestrians and bicyclists may be less common than in shared use paths, so they’re often a better choice than paths in urban areas where pedestrian volumes are higher. Cycle tracks are more flexible than paths in that they can be implemented either between the curbs or on the sidewalk side of the curb. 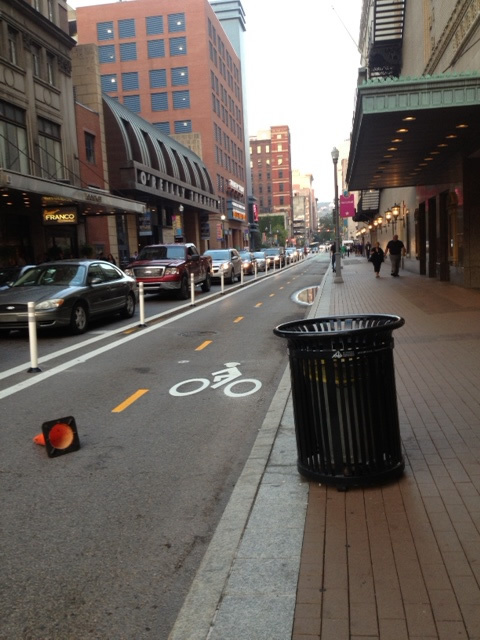 Like any bicycle facility type, however, cycle tracks have weaknesses as well as strengths. Their biggest weakness may be that riding in them often takes more time and is more awkward than riding in conventional bike lanes or travel lanes. Executing certain turns from a cycle track can be a time-consuming process, requiring riders to cross an additional street or wait at an additional red light. 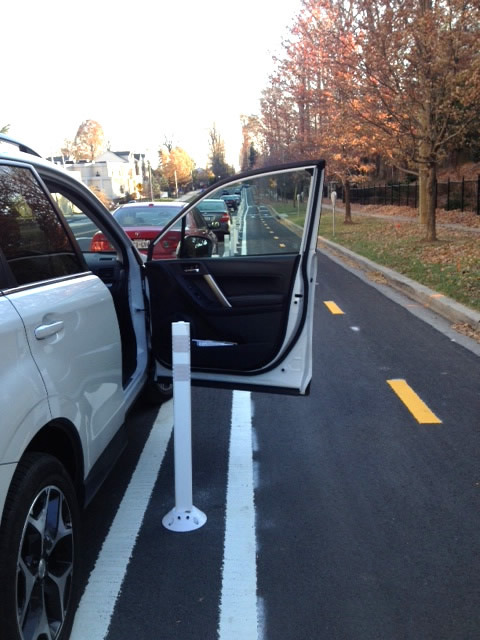 The barrier that keeps cars at bay may also prevent cyclists from shifting from the cycle track into the travel lanes, a maneuver used when preparing for a left turn or avoiding an obstruction. And while pedestrian conflicts are less frequent in cycle tracks than on shared use paths, walkers do wander into cycle tracks, undermining their utility. Some pedestrians don’t even realize they are standing or walking in a bike facility. Cycle tracks placed between parallel parking and the curb are especially prone to pedestrian conflicts as people load or unload their cars or walk to the curb. Cyclists have to ride slowly to anticipate such conflicts where they’re likely to occur. 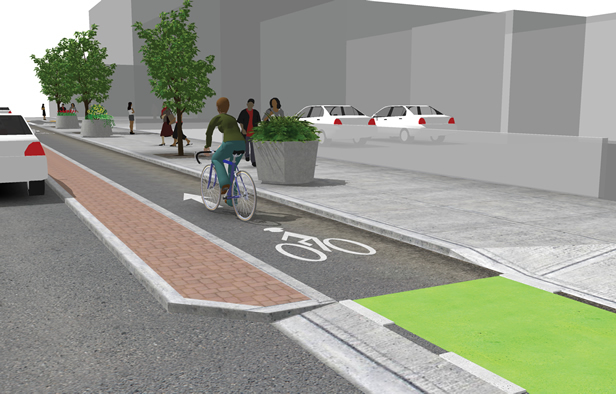 Cycle tracks may require more space than conventional bike lanes, depending on the street configuration. However, it may be possible to place the cycle track on the sidewalk side of the curb where it doesn’t compete for space between the curbs as a conventional bike lane would. Two-way cycle track on two-way 15st St NW in D.C.
Two-way cycle tracks along two-way streets have some additional drawbacks. Generally speaking, these facilities are less safe than one-way cycle tracks because, like roadside paths, they put cyclists traveling in two directions on one side of the street (except when the cycle track is in the middle of the street). This results in half the cyclists riding against the flow of adjacent car traffic, surprising drivers accustomed to looking in certain directions for vehicles. Intersections involving two-way cycle tracks are more complex than those involving one-way cycle tracks and may require special accommodations to guide cyclists through the intersection and minimize conflicts. Sometimes dedicated bike signals are warranted. Where a two-way cycle track begins or ends, cyclists heading in one direction must cross the street to continue, requiring similar measures. 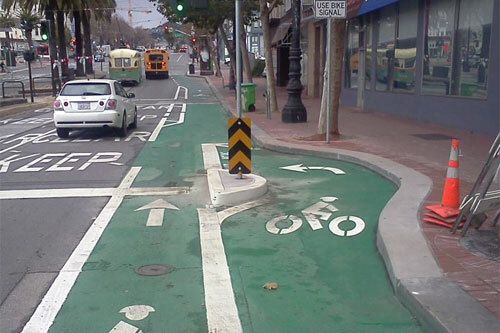 If due accommodations aren’t provided at intersections or transition points, cyclists are forced to improvise, possibly making the facility less safe than conventional bike lanes. Also, two-way cycle tracks can reduce access to one side of the street if the rider must make a U-turn and double back on the side without the cycle track to reach his or her destination. 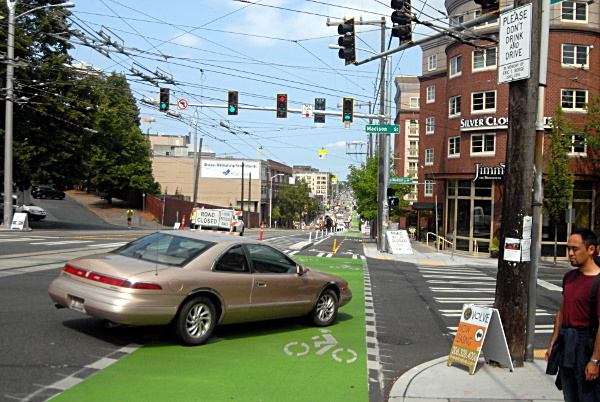 Two-way cycle track on two-way street in Seattle with dedicated bike signal (click for Google street view). The driver is disobeying the red arrow signal. Cyclists who choose not to ride in a cycle track may face hostility from drivers who wonder why cyclists can’t use the obvious facility provided specifically for them. Cycle track signs, bollards and paint send the message that cyclists are supposed to stay in their own area. But often the very space that would allow drivers and cyclists to share the road without conflict has been eliminated to create room for the cycle tracks. 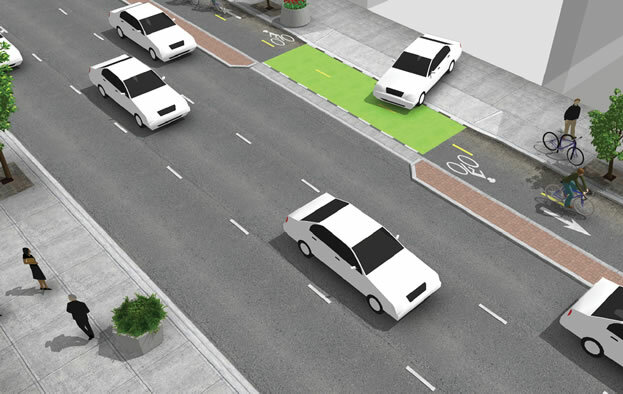 Riding in the road allows cyclists to take advantage of design features and protocols that have evolved over a century to facilitate efficient, orderly movement of vehicles – things like through-lanes, turn lanes, and well-understood rules of right-of-way. Cycle tracks can undermine this option. Shared use paths may be more suitable than cycle tracks in some contexts, such as to fill gaps in hiker-biker trails that children and other inexperienced riders are likely to use. Cycle tracks often require riders to interact with car traffic, obey novel pavement markings, improvise at intersections, be wary of parked cars, and generally be alert and keep moving, whereas paths are more tolerant of mistakes and casual stops. Providing both a shared use path and conventional bike lanes – a so-called dual facility – can be a good alternative to cycle tracks on some streets. Experienced cyclists who would benefit from a faster facility may use the bike lanes while riders who prefer greater separation from car traffic may use the shared use path. Ultimately the decision of whether to provide a cycle track instead of another facility type requires an evaluation of whether the benefits relating to comfort, overall safety, and increased bike use are outweighed by the cost to cyclists in terms of travel time and intersection safety. Cycle tracks do not fully protect bicyclists at intersections, a common site of bicycle crashes, and some designs actually increase the risk at intersections, whereas riding in the roadway puts cyclists where drivers approaching an intersection already look for vehicles – in the road. However, perception of safety may be almost as important as reality. Increasing the level of bike use makes cycling safer on all roads, not just roads with bike accommodations, since there is indeed safety in numbers. So on roads where traffic is fast and busy, cycle tracks may be the better solution. On a minor street where traffic is tame, cycle tracks might not offer enough benefit to justify the drawbacks. 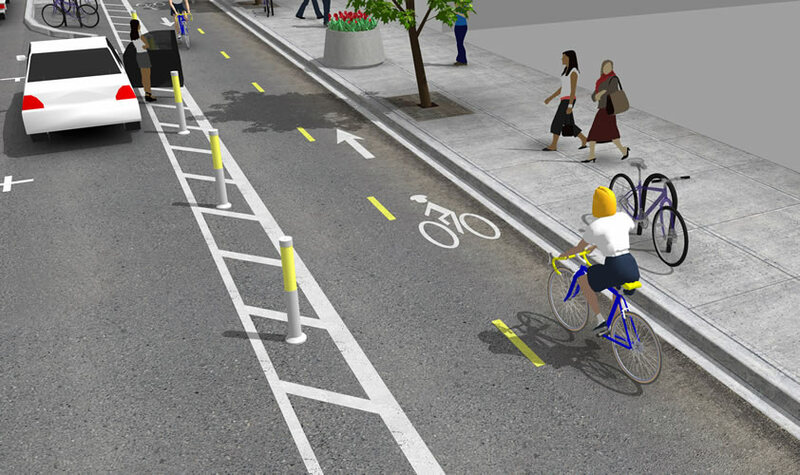 The facility decision may depend on who is likely to use the street – inexperienced riders or people who bike every day. Increased comfort may encourage cycling among some users, while extra travel time may discourage it among others. On some streets, adding cycle tracks might not be possible without creating terribly awkward intersections or putting cyclists too close to opening car doors. Bad cycle tracks are worse than no cycle tracks, and there are other facility types in the tool kit. In addition, external factors like impact to pedestrians must be considered. Finally, whenever cycle tracks are installed in the county, DOT and other stakeholders should conduct a “lessons learned” analysis to see what worked and what didn’t and make recommendations accordingly. So to reiterate… MoBike enthusiastically endorses cycle tracks as a facility type to be used where warranted. Based on my commuter use of the L and M St cycle tracks (one-way) and 15th St (2-way) I’d say the complexity of the 2-way increases by orders of magnitude over 1-way. It makes pedestrian interaction particularly difficult at intersections, not to mention clueless tourist drivers and casual cyclists. IMO they are an absolute last resort. I’d like to know what DOT thinks they’ve learned from the Woodglen installation. I don’t think it provides any improvement at all for experienced cyclists. It definitely lacks controls at the endpoints – what is described here as bicyclists “improvising” is unacceptable to me, for any level of cyclist. (Hence my criticism of the Woodglen/Edson intersection) I hope that in future, every available option is exhausted before another 2-way track is contemplated.